Elizabeth is excited to announce the release of her latest collaboration with author Amanda DeWees: Nocturne For a Widow, the first book in the Sybil Ingram Victorian mystery series, now available at Audible! Elizabeth narrated Amanda’s wonderful gothic mysteries With This Curse and Cursed Once More last year; the former introduces Sybil Ingram, the actress protagonist of Nocturne For a Widow. You can read more about the novel at Amanda’s website, and listen to a scintillating sample at Audible! The year is 1873, and Sybil Ingram has come to a crossroads. Once she was the toast of the London stage, but now that she’s 28 years old – very well, nearly 30 – her draw isn’t what it used to be, and her theater troupe is foundering. When her trusted mentor asks her to take the blame for his financial misdeeds, Sybil sees no choice but to retire from the life she loves and move to America to marry New York City hotel magnate Alcott Lammle. But her path to happiness is cut short when Lammle dies suddenly – and in financial ruin. Widowed, nearly penniless, and unable to return to England, the determined diva sets out to stake a claim on Brooke House, an eccentric neo-Gothic manor in the wilds of the Hudson River Valley. She soon finds, however, that a ghostly presence wants her gone. Even worse, her claim is challenged by the most insolent, temperamental, maddeningly gorgeous man she’s ever met: Roderick Brooke, a once-famous former violinist whose career ended in a dark scandal. Soon it’s a battle of wills as Sybil matches wits – and trades barbs – with Roderick, finding herself increasingly drawn to him despite her growing suspicion that there is a connection between him and the entity that haunts Brooke House. But an even greater threat arises in the form of the mysterious, powerful queen of local society, Mrs. Lavinia Dove. For reasons that Sybil can’t imagine, Mrs. Dove is determined to oust Sybil from her sphere…and the lengths to which she will go are chilling indeed. By turns mysterious and moving, sparkling and spooky, Nocturne for a Widow follows a spirited heroine through adventures in life, love, and death. From the colorful theatrical world of late-Victorian London to the American wilderness, Sybil’s travels will test her mettle – and her heart. 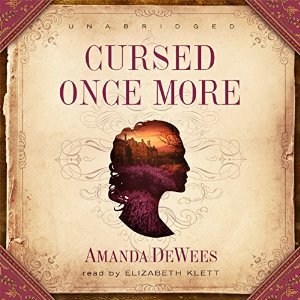 Elizabeth is thrilled to announce the release of Cursed Once More by Amanda DeWees, now available at Audible! This is the sequel to With This Curse, winner of a 2015 Daphne du Maurier award, which Elizabeth also narrated earlier this year. These Victorian Gothic suspense novels are perfect for fans of Elizabeth’s LibriVox recording of Jane Eyre. You can visit the Audible page to hear an audio sample, and read Elizabeth’s interview with Amanda DeWees on her blog. Clara grew up believing that her mother’s family had disowned them. But the grandmother Clara never knew is now entreating her to visit Thurnley Hall, the family seat in Yorkshire. The old lady is on her deathbed and anxious to disclose vital family secrets before it’s too late – for Clara’s unborn child may be cursed with a horrible fate. Accompanied by her devoted husband, Atticus, Clara arrives at Thurnley to find intrigue brewing. Her boorish uncle, Horace Burleigh, is greedy for her wealth and desperate to protect the family’s mysteries. Superstitious fear of Atticus torments the hulking Romanian servant, Grigore, and even the soft-spoken young ward, Victor Lynch, may have secret motives for getting close to Clara and her husband. When her grandmother dies under suspicious circumstances, Clara feels compelled to investigate. And when Atticus vanishes mysteriously, she must draw on all her strength and determination to find him before his time runs out…before her life can be cursed once more. 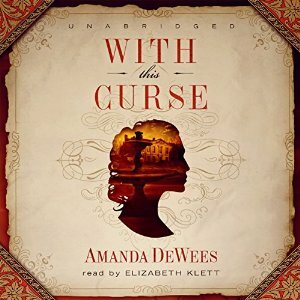 Elizabeth has a wonderful new release today: the Victorian Gothic novel With This Curse by Amanda DeWees, now available at Audible! Amanda writes love stories with a touch of darkness, and With This Curse is an enthralling romance, and a finalist in the Daphne du Maurier Awards for 2015. You can find out more at Amanda’s website, and listen to an audio sample at Audible. Elizabeth will also be narrating the sequel to this book, Cursed Once More, later this year. Elizabeth has also done an interview with Amanda on her blog. Can a curse strike twice in a woman’s life? In 1854, 17-year-old chambermaid Clara Crofton was dismissed from Gravesend Hall for having fallen in love with Richard Blackwood, the younger son of the house. Alone in the world, Clara found a tenuous position as a seamstress, but she always blamed the Gravesend curse for the disaster that had befallen her – and for Richard’s death soon after in the Crimean War. Now, more than 18 years later, Richard’s twin, Atticus, seeks out Clara with a strange proposal: If she will marry him and live with him as his wife in name only to ease the mind of his dying father, Atticus will then endow her with a comfortable income for the rest of her life. Clara knows that he is not disclosing his true motives, but when she runs out of options for an independent life, she has no choice but to become Atticus’ wife. For Clara, returning to Gravesend as a bride brings some triumph…but also great unease. Not only must she pretend to be a well-born lady and devoted wife to a man whose face is a constant reminder of the love she lost, but ominous portents whisper that her masquerade brings grave danger. “This house will take from you what you most treasure,” her mother once warned her. But the curse has already taken the man Clara loved. Will it now demand her life?